"Parsifal and the Flower Maidens"
From Act 2 of my favorite opera, Parsifal, Wagner's last. Parsifal, the Compassionate Fool, is searching for the Holy Spear and he gets to Klingsor's Magic Garden. He's tempted by the Flower Maidens who sing and dance circles around him to attempt to seduce him and make him fail in his mission to recover the Spear, heal the wound from it suffered by Amfortas, and restore the Holy Grail. Parsifal resists, only to have the seductress Kundry appear on a bed of flowers in her attempt to seduce and ruin him. Parsifal resists, recovers the Spear, and in Act 3 he heals Amfortas' wound, he's released to die, as is Kundry, and Parsifal becomes King of the Grail. 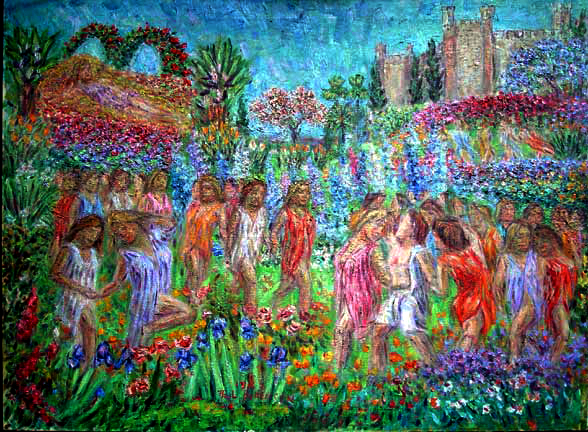 The subject appealed to me on many levels, not the least the opportunity to go wild with emptying my palette of all the color I could conjure with the flower garden which was pretty much of a composite of every flower I had painted until then, including the Tulip Tree between Kundry and Klingsor's castle. Also the undulating rythmns of the Flower Maidens in their brightly colored, diaphanous gowns as they dance around Parsifal. PaulB's Pointillistic/Impressionist original oil paintings of Wagner Opera and various prints and poster formats of a wide variety of subject matter by the Pointillistic/Impressionist oil painter from landscape/waterscape paintings, dance, sports, portrait, to classical figures, flowers, rock and roll, Brazil, and Wagner Opera paintings and prints are available for purchase for as little as $24.95 for an 8" x 10" matted print on photo pape. Pointillistic/Impressionist Giclee prints of Wagner Opera on real canvas or heavy watercolor paper are available. One of a kind Wagner Operaan embellished prints, which are Giclee prints retouched in genuine oil paint by PaulB. Unless noted PaulB's original Pointillistic/Impressionist oil paintiings are oil on canvas. Paul Berenson's pointillistic/Impressionist oil paintings are in privale collections around the world, including the downtown Los Angeles Athletic Club and have appeared in numerous publications, including the New York Philharmonic Playbill. PaulB.com also builds websites and PaulB is a member of the LA Web Professionals Group.